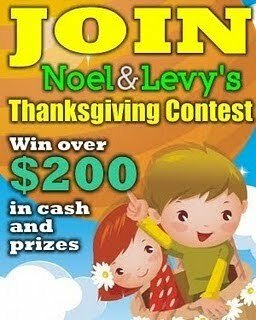 Win Over $200 Cash and Prizes from Noel and Levy’s Thanksgiving Contest! Do you want to win over $200 in cash and prizes? If your answer is “yes,” then you should join Noel and Levy’s Thanksgiving Contest! Consolation Prize: $5 plus AD SPACES will be raffled to 5 people. Also, the first 5 people to blog about this contest will automatically get $3 each. Note: The early birds were already announced; please check Levy’s list of winners in her blog. 1. Blog about the contest and include the list of sponsors. Place the contest widget on your sidebar and leave the URL of your blog post here. 3. Subscribe to Noel and Levy’s RSS Feeds. Only blogs that are at least 1 month old with at least 10 posts are qualified to join this contest. Sponsors are welcome to join also.Contest runs from June 7 to June 30, 2010. Winners will be announced on July 4. This entry was posted in Blog Contest, Thanksgiving Contest. Bookmark the permalink. One Response to Win Over $200 Cash and Prizes from Noel and Levy’s Thanksgiving Contest! wow, how generous naman of Noel and Levy… goodluck to your entry mommy!